It’s always a tricky proposition to make a list of the best coffee shops. Because let’s be honest. I’m not visiting them all. There are hundreds in Lisbon, and truth be told, I’m trying to cut back a bit. I tend to love coffee a little too much, and from all outward appearances, so do the fine folks of Lisbon. There are coffee shops on every corner and down every twisted little alley. Oh wait, that’s not an alley. It’s a street. There is a car coming! Quick, duck into this little shop here, the one with the sound of a grinder and the banging of the espresso wand. See how they are knocking out the finished grounds? It’s crowded here in this little coffee shop. Is it the best one? With this crowd, it must be. People are standing and talking shoulder to shoulder over a thin long and tall table that is littered with empty espresso glasses and pastry crumbs and ashtrays. We could be in Italy with how quickly people come in and out to drink their espresso. There is no room for a laptop here. This is not a second wave coffee shop at all. This is really first wave. This is pre wave. This is a flat dark pond. No wait, that is my Americano. It sits on a small saucer with a spoon, but no milk or sugar is offered, and I won’t ask for it either. I drink it black, but it always comes with a tiny spoon. Somewhere amongst the blueprints for building an empire like Portugal is a decree by a long dead king that states this. For every cup and saucer, a spoon. I’m sure of it. Ask your guide. While you are asking, ask them to bring you to this coffee shop. You know the one. You’ve passed it a dozen times already without realizing it. At night it looks like nothing. With the shutter closed, it could be a little supply room for mops and brooms. During the day it’s always busy serving espresso and sometimes strange sausages with beer. It’s not just a coffee shop. That’s what makes it so special. It’s a hub. Some people drink beer, some have a cocktail or wine. Everybody comes to talk. It’s impossible to quantify a coffee shop like this. The best coffee shop in Lisbon for me is likely the one right down the street from my apartment. Or maybe it’s the little coffee shop on the way to work. Or the one that is across the street from work. Or maybe it’s that coffee shop we go to with our laptops to do to get out of the apartment. You know the one. The roomy one with all that light. It’s so quiet in there. Nobody talks. Music plays faintly in the background, but it’s only for the baristas because all the customers have their headphones on and are working. That’s the beauty of Lisbon right there. That’s one of the things we love about it. Lisbon has a coffee shop for everybody and all their various coffee drinking moods. There is, however, one coffee shop that always obsesses me. It’s always the one your friend raves about and so you go and they are closed so you curse and go back the next day only to find the same closed door, the same pulled shade. That one. Aside from visiting the little side street local coffee shops found all over Lisbon, I did venture into the tried and true joints that cater to digital nomads and tourists alike. They are aplenty and seem to pop up like mushrooms after a few days rain. Not to say that all these coffee shops are the same. They aren’t. They all have their quirks and appeal to all kinds of people, generally not local. They are, however, similar in their assortment - single origin and pour overs abound here next to the avo toast (more on that below). So pick your poison and get ready to get to be over caffeinated when you visit Lisbon. 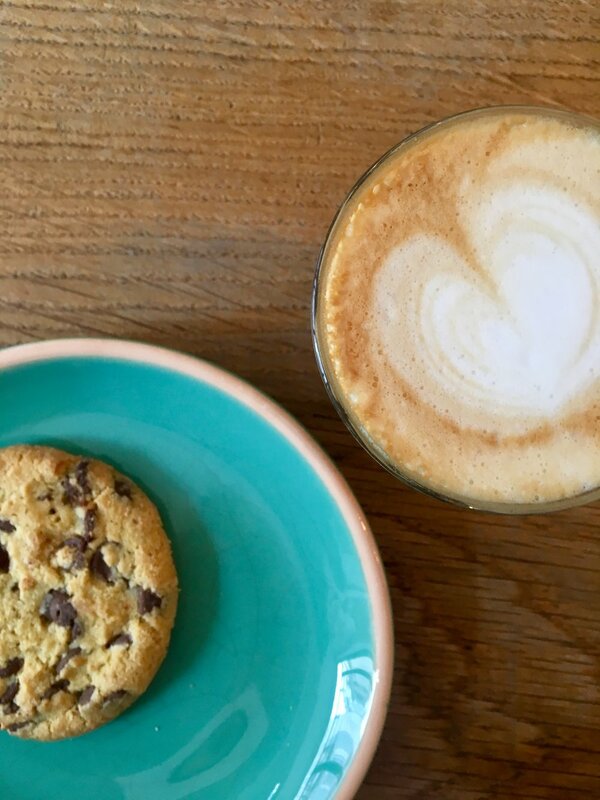 I did have a nice cortado here, and when I went to take a picture of it for this blog post, the girl next to me advised me that it would look better with a cookie, and kindly offered me hers for the photo. She was right and I reluctantly gave it back to her. The ambiance is nice and the music is great if you aren’t listening to your headphones. Several people were on their laptops, but one Japanese girl was resting her head on the table writing in her journal. They have a small food menu, but I didn’t try anything. I was here for the coffee and let me tell you. It was smooth! I chose the cortado because I wanted to linger, but not too long. Check the hours. I think they are closed on Saturday and Sunday, which is just crazy. Like people don’t drink coffee on the weekends?! Hello, Kristof, I’m sure you have your reasons. We were in the neighborhood (kinda) so I diverted us to Fabrica Coffee Roasters for a cuppa coffee. It seems there are a few around Lisbon, so mind which one you go to, but after our first experience, we may not be back. I mean, the coffee was good and the ambiance was typical coffee shop - wood paneling and burlap upholstered sofas you see on every Instagram post, but Jill was hungry and decided to order the avocado toast. I think the spoon on saucer decree also mentioned that 2nd wave coffee shops must also have an avocado toast. I always refrain from getting this because it’s something I make at home for cheap when I’m feeling lazy. I knew she wasn’t going to be happy when a single sad piece of toast showed up with maybe 1/4 of an avo on it. Takeaway about Fabrica Coffee Roasters: come for the coffee and make your own avo toast. It was a rainy day the very first time we stepped into the steamy confines of the Copenhagen Coffee Lab on our first visit to Lisbon in 2017. My recent visit was not much different, although I’ll note that the big square table filled with loud expats was thankfully missing today. The big has been replaced with a few smaller ones and the expats have likely moved to the other room. This is no ordinary coffee shop. 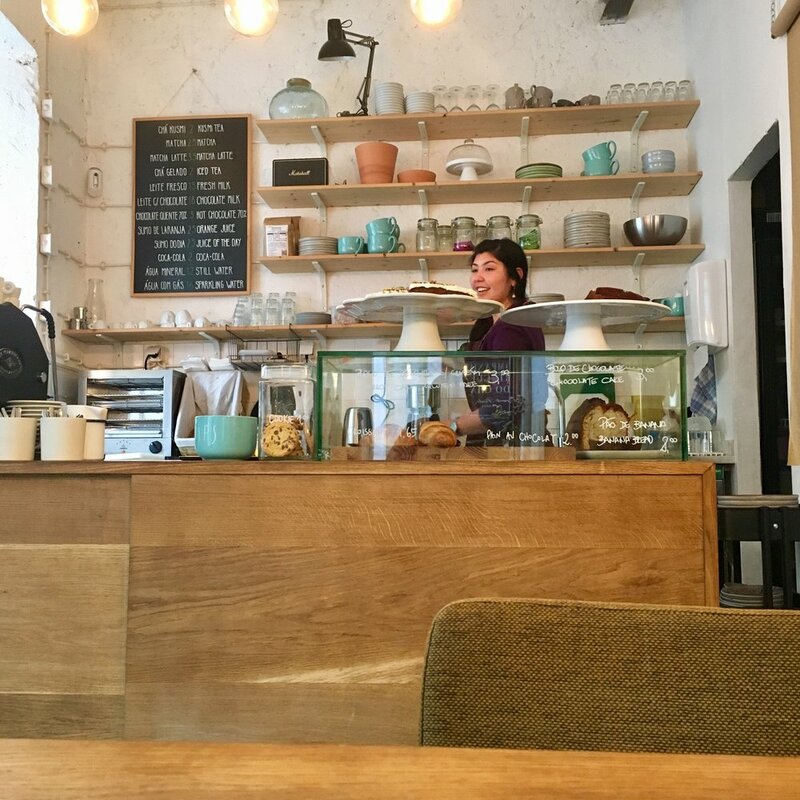 While you will find the types of coffee and brew methods at nearly any 2nd wave coffee shop in Lisbon, Copenhagen Coffee Lab lives up to its name quite strongly in both atmosphere and delectables. They have the dense and nutty rye bread, the twisty cinnamon knots and overnight museli for starters, along with a few vegan options too. Hipster cafe without the hipster level of customer service. Well worth multiple visits. But truly the very best coffee shop in Lisbon isn’t a coffee shop. It’s a coffee roaster, and it’s called Flor de Selva and it’s located in the Madragoa neighborhood. I spent a few frustrating days trying to find them open only to realize that the window I was peering into was a storage room - the real business was across the street. They are only one of two remaining roasters in Europe that roast their beans using a wood fire. We encountered the fine coffee here while on a food tour with Culinary Backstreets. If you are looking for a definitive answer to this elusive question, you won’t find it here. You have to do what I did and comb the city drinking tons and tons of coffee. You’ll have to ask yourself what it is you are really looking for. Is it a quick hit of espresso while you wander the streets of Lisbon? Do you want to sit down and do some work? Do you want to feel like a local and squeeze into any number of tiny little bars in the back alleys? Or do you want to feel the blast of a wood fired coffee roaster and buy some coffee for use at home? No matter what your answer, you’ll be sure to find it all in Lisbon.